Summary: Low-complexity siRNA pooling (e.g. Dharmacon siGENOME SMARTpools) does not prevent siRNA off-targets. It may in fact exacerbate off-target effects. Only high-complexity pooling (siPOOLs) can reliably ensure on-target phenotypes. One of the claims often made in favour of low-complexity pooling (e.g Dharmacon siGENOME SMARTpools) is that this pooling reduces the number of seed-based off-target effects compared to single siRNAs. If this were true, we would expect different low-complexity siRNA pools for the same gene to give similar phenotypes. But this is not the case. Published expression data shows that low-complexity pooling actually increases the number of off-targets. Kittler et al. (2007) looked at the effect of combining differing number of siRNAs in low to medium complexity siRNA pools (siRNA pools sizes were: 1, 3, 5, 9, and 12). Low-complexity pooling does not get rid of the main problem associated with single siRNAs: seed-based off-target effects. Based the above analysis, it can make it even worse. It also prevents use of the most effective computational measures against seed effects. 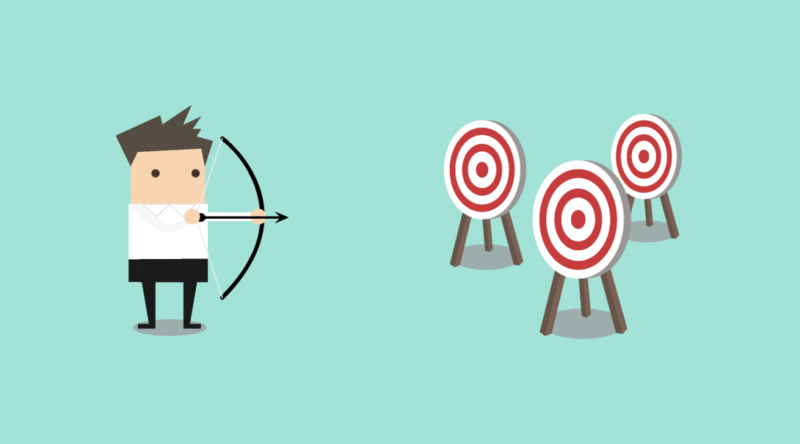 Redundant siRNA Activity (RSA) is a common on-target hit analysis method for single-siRNA screens. It checks how over-represented the siRNAs for a gene are at the top of a ranked screening list. If a gene has 2 or more siRNAs near the top of the list, it will score better than a gene that only has a single siRNA near the top of the list. This is one way to reduce the influence of strong off-target siRNAs. Correcting single siRNA values by seed medians has also been shown to be an effective way to increase the on-target signal in screens. This correction is not effective for low-complexity pools, since each pool can contain 3-4 different seeds. Off-target based hit detection algorithms (e.g. Haystack and GESS) are also only effective for single-siRNA screens. The advantage of these algorithms is that it permits the detection of hit genes that were not screened with on-target siRNAs. These algorithms are not effective for low-complexity pool screens. We do not recommend that screeners combine their single siRNA libraries into low-complexity pools (e.g. combining 3 Silencer Select siRNAs for the same target gene). If possible, it is better to screen the siRNAs individually and then apply seed-based correction, RSA and seed-based hit-detection algorithms. The time saved by only screening one well per target may prove illusory when the deconvolution experiments show that the individual siRNAs have divergent phenotypes. It is probably better to deal with off-target effects up front (by screening single siRNAs) than to be surprised by them later in the screen (during pool deconvolution). Reliable high-complexity siPOOLs, as independent on-target reagents, can then be used to confirm screening hits. siTOOLs also now has RNAi screening libraries available. Please contact us for more information. What is the probability of an siRNA off-target phenotype? Summary: Conventional siRNAs have a high probability of giving off-target phenotypes. siRNA off-target effects can be reduced by using more specific reagents or narrowing the assay focus (to reduce the number of relevant genes). Even when the assay is relatively focused, more specific reagents significantly increase the probability of observing on-target effects. The probability of getting an off-target effect from an siRNA depends on several factors, the main ones being reagent specificity and assay biology. If an siRNA down-regulates a large number of genes, or if an assay phenotype can be induced by a large number of genes, the probability of observing an off-target phenotype increases. Garcia et al. (2011) compiled 164 different microarray experiments measuring gene expression following transfection with siRNAs. The mean number of down-regulated genes in these experiments was 132 and the median was 68 (down-regulated genes were silenced by 50% or more). As noted in earlier studies of gene expression following siRNA treatment (e.g. Jackson et al. 2003), few of the down-regulated genes are shared between siRNAs with the same target gene. This suggests that the down-regulated genes are not the downstream result of target gene knockdown (i.e. they are mostly off-target). 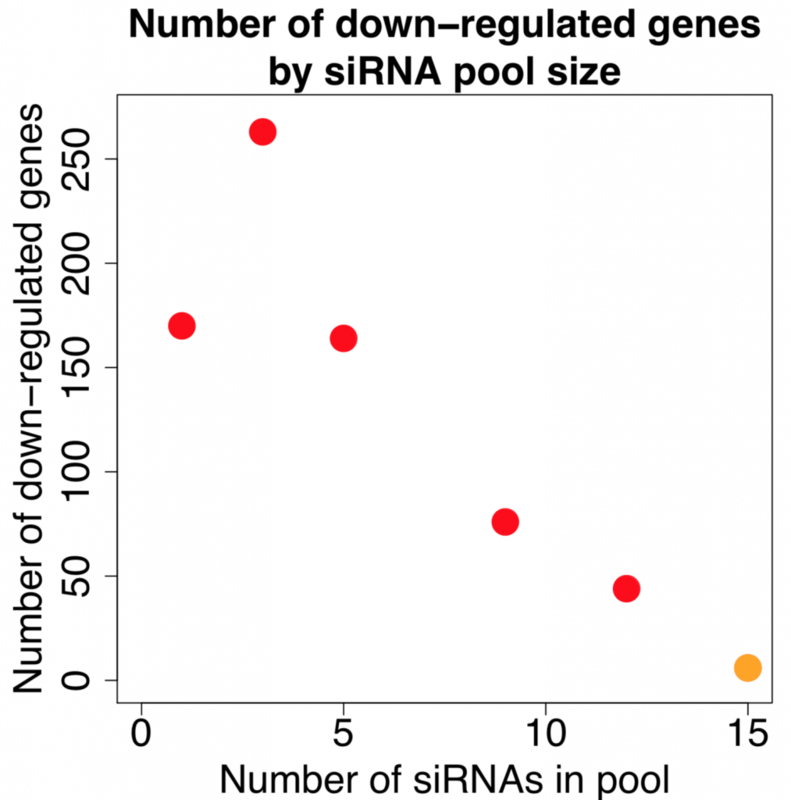 High-complexity pooling of siRNAs (e.g. with siPOOLs) can reduce the number of down-regulated genes. Assuming different numbers of down-regulated genes (off-target) and different numbers of potent genes involved in assay pathways, we can try to estimate the probability of an siRNA giving an off-target effect. 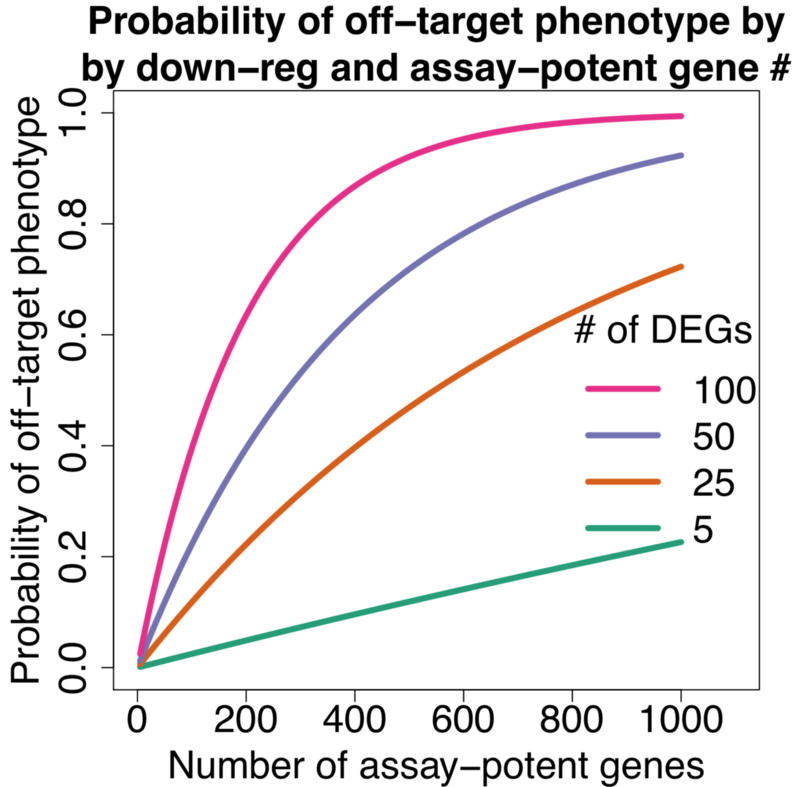 We can see that even if there are only 20 assay-potent genes, there’s a nearly 10% chance of getting an off-target phenotype when siRNAs down-regulate 100 off-target genes (which is close to the average observed in the Garcia dataset). In a genome-wide screen of 20,000 genes with 3 siRNAs per gene, we would thus expect 2,000 off-target siRNAs. In contrast, a more specific reagent that only down-regulates 5 off-target genes only has a 0.5% change of producing an off-target phenotype. For the above-mentioned genome-wide RNAi screen, we would expect only 100 off-target siRNAs (a 20-fold reduction). The above analysis demonstrates the importance of using specific siRNA reagents. Changing an assay to make the phenotypic readout narrower (to reduce the number of genes capable of inducing a phenotype) is one way to reduce the risk of off-target phenotypes. 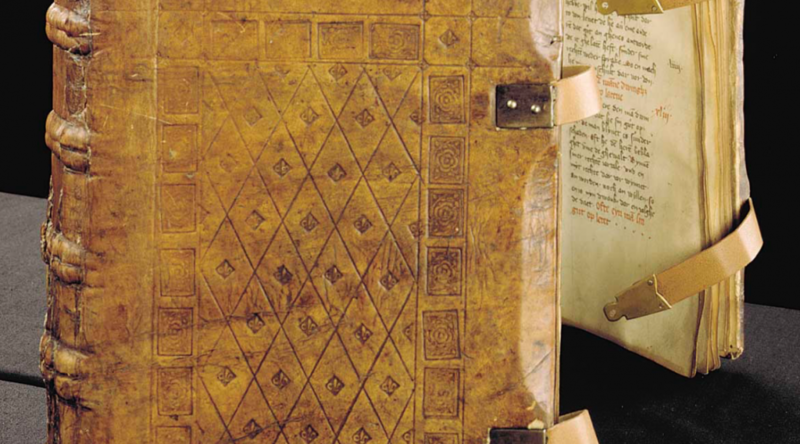 But this may be a lot of work and is not necessarily desirable or even possible. A more ideal solution is the use of a specific RNAi reagent, like siPOOLs. 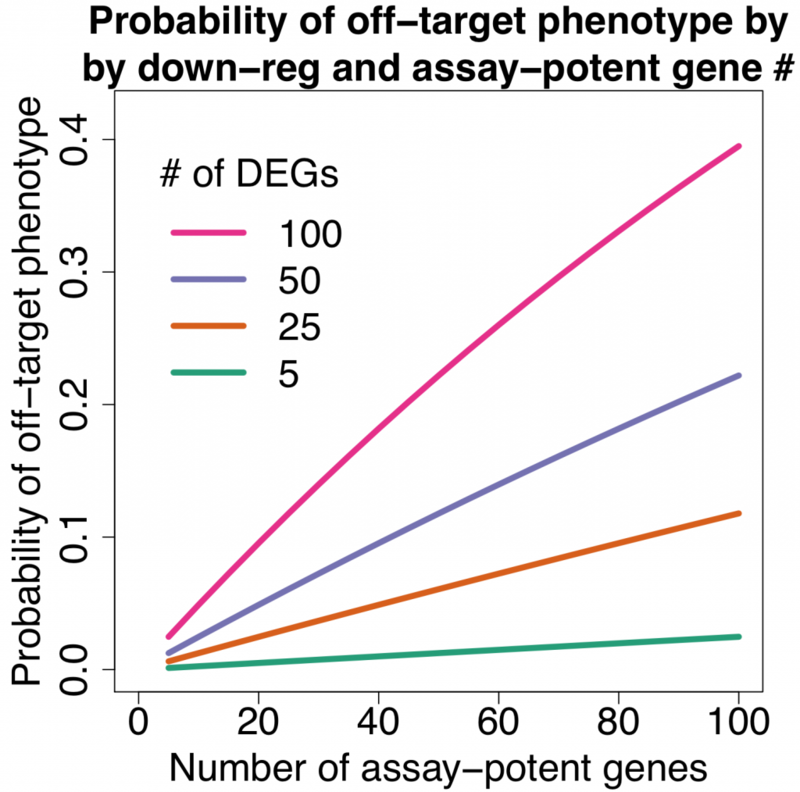 As the number of assay-potent genes increases, the probability of getting an off-target phenotype approaches one. The p-values were calculated using the hypergeometric distribution, assuming a population size of 20,000 (the approximate number of protein-coding genes in the human genome). Note that one of the major simplifying assumptions of the above analysis is that all siRNAs have the same number of down-regulated off-target genes. Summary: Effective functional genomic screening depends on a variety of factors that need to be simultaneously addressed to obtain meaningful results. A recent Cell Reports paper demonstrates this by taking a holistic approach to siRNA screening with the use of multi-isoform/multi-gene targeting to address redundant paralogs and pathways in cancer cells. Many RNAi screens use arrayed single gene knockdowns to find genes that play an important role in a biological process. The idea is that a single bullet is enough to take down its target leaving a gaping hole that one cannot fail to notice. In some cases, this is true, and is certainly relied upon by drug developers seeking to create specific mono-target drugs. However, in complex diseases like cancer, cells have evolved fail-safe mechanisms to make them more resistant to external assaults. A single bullet is simply not enough. Take for example oncogenic protein RAF or Rapidly Accelerated Fibrosarcoma, a tyrosine kinase effector that is a component of the MAPK signalling pathway (Ras-Raf-MEK-ERK). RAF has three isoforms – ARAF, BRAF and RAF1 (also called CRAF). Studies in mouse embryonic development show they all share some form of functional redundancy as knocking out two isoforms produces more severe effects than knocking out each isoform alone. Screens that target single genes/isoforms therefore tends to bias results towards genes that have no paralogs or only have single isoforms. This was indeed the reason why classical Ras effectors were not identified in previous screens. The authors of the study did a focussed siRNA screen on 41 RAS effector nodes represented by 84 genes. Out of the 41 nodes, 25 of them had 2-4 functional paralogs where combinatorial gene silencing was carried out with multiple siRNAs. 5 nodes knocked down multiple members of a protein complex. 5 nodes had siRNAs targeting multiple steps within a pathway. Only 6 nodes silenced single genes (highlighted). The only caveat with designing such a screen is the requirement for prior knowledge to perform meaningful gene silencing combinations. In this instance, many of the Ras effector pathways are characterized sufficiently to do this well however in other less studied fields, this could be a challenge. Useful tools that would help in designing gene knockdown combinations would include pathway or phenotype databases such as KEGG, REACTOME or Wikipathways. The Phenovault which siTOOLs Biotech is developing, is yet another potentially useful tool.. more details to come! The authors also highlight how a screen that reads only one phenotype might miss other important gene functions. Many RNAi screens sadly still stick to measuring cell proliferation as their only read-out which is greatly influenced by siRNA off-target effects. Here, 5 different phenotypes were measured (cell size, proliferation, apoptosis, reactive oxygen species [ROS], and viability). It was noted that silencing of Cdc42 had little effect on cell viability yet a prominent effect on ROS levels. To take this up a notch, analysis was also performed at the single-cell level in cells expressing uniform levels of GFP and co-transfected with GFP siRNA. This allowed authors to correlate phenotypes with levels of gene knockdown, generating dose-response curves. How clever! A lot more work, but adds to data robustness especially when using single siRNAs that are known to be rather variable. Many reports and our own observations attest to the heterogenous response of different cell lines to the same treatment. In cancer especially, the large heterogeneity necessitates the use of multiple cell lines. Not doing so would be failing to account for the large genetic diversity observed in the clinic. The authors screened 92 cell lines derived from lung, pancreas and colorectal tissue. Despite seeing heterogenous responses to node knockdowns, phenotypic responses could be distinguished into several groups based on effector engagement. A major group dependended on RAF through direct binding with KRAS, a second major group worked via RSK p90 S6 kinases to drive RSK-mTOR signalling. And a third minor group was dependent on RalGDS. 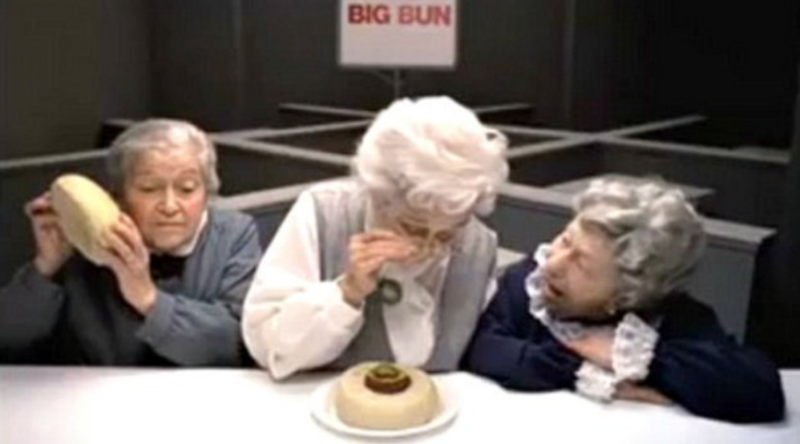 They went on to focus on the first two major groups, naming them KRAS-type and RSK-type respectively. 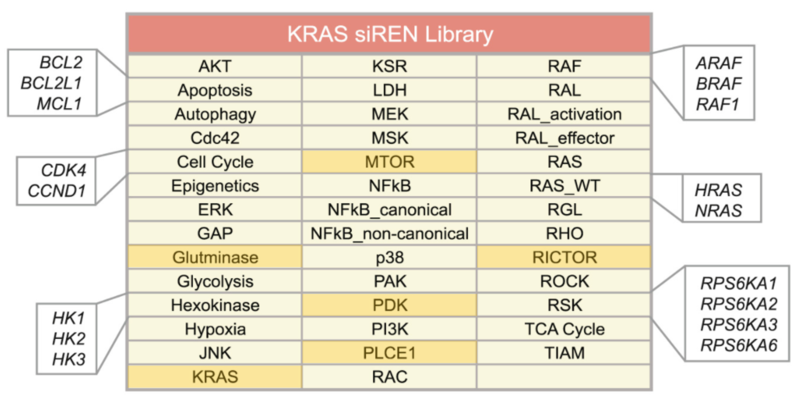 The authors used previously characterized siRNAs to select for more potent siRNAs. This involved an RNAi sensor reporter-based assay that required the generation of 20,000 clones. The reporter was also shRNA-based. Due to heterogeneity in Dicer-mediated cleavage of shRNA, its uncertain if knockdown potency is accurately reflected when translated to siRNAs (read about the difference between shRNAs and siRNAs). In any case, its a lot of work to characterize all siRNAs to be used in a screen. Furthermore, off-target effects are not addressed. The authors stuck to a maximal concentration of 12 nM where 2 nM of siRNA was applied per gene. At 2 nM per siRNA, one still risks deregulating other genes. One of the first papers by Aimee Jackson et al., demonstrated an siRNA targeting MAPK14 deregulated many other genes even at concentrations of 1-4 nM. An important consideration is to ensure total siRNA concentrations are kept constant. In which case, a negative control siRNA has to match or follow the maximal siRNA concentration used. Using different levels of siRNAs runs the risk of biasing off-target effects towards sequences present at higher concentrations. As with all scientific hypothesis, it helps to arrive at the same conclusion with different approaches. The two different effector response subgroups identified also responded differently to small molecules. The KRAS-type lines being more sensitive to EGFR and ERK inhibition while the RSK-type lines more sensitive to inhibitors of PDK1, RSK, MTOR, S6K1 and DNA repair enzymes. This was attributed to the latter’s higher basal metabolic activity manifested in larger investments towards oxidative phosphorylation and mitochondrial ribosome maintenance. By also projecting signatures obtained from cell lines into patient samples (in The Cancer Genome Atlas, TCGA), the subtypes were also effective at predicting differential sensitivity to multiple drug treatments. This highlights the importance in designing effective drug combinations in cancer. Interestingly, the authors also performed CRISPR pooled screens in parallel. However, due to the restraints of being only able to knockout 1 gene at a time, smaller effects were seen due to gene redundancy. However, they did go on to use CRISPR as well to mutate key genes to affirm the pathway relationships established. Is it important to avoid microRNA binding sites during siRNA design? 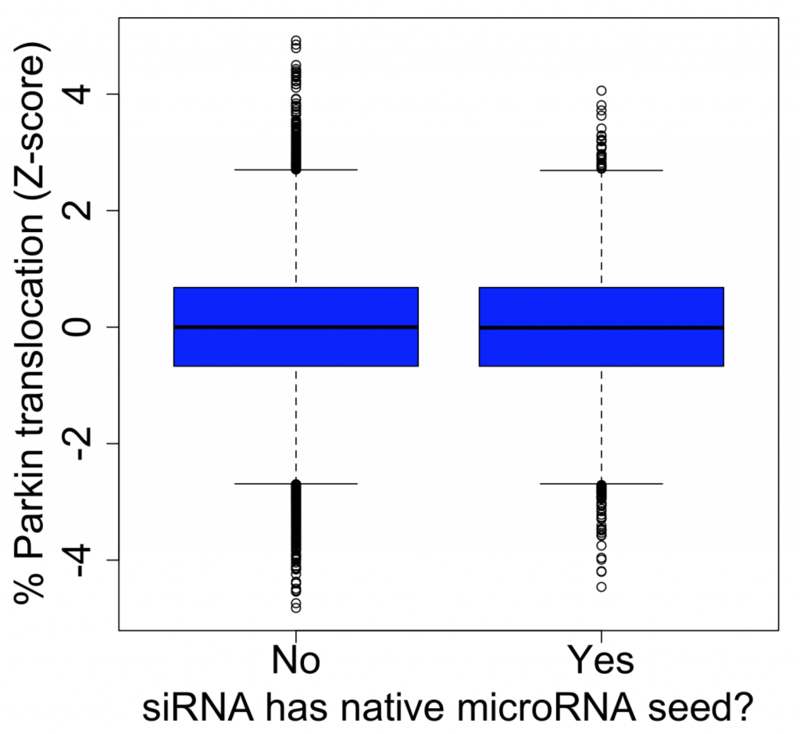 Summary: To address the question of whether one should avoid microRNA binding sites during siRNA design, we examined whether removing siRNAs that share seeds with native microRNAs would reduce the dominance of seed-based off-target effects in RNAi screening. RNAi screens are powerful and readily implemented discovery tools but suffer from shortcomings arising from their high levels of false negatives and false positives (OTEs) as can be seen when comparing the low concordance among the candidate genes detected in different screens using the same species of virus, e.g., HIV-1, HRV, or IAV (Booker et al., 2011; Bushman et al., 2009; Hao et al., 2013; Perreira et al., 2015; Zhu et al., 2014). To address these concerns, improvements in the design and synthesis of next-gen RNAi library reagents have been implemented including the elimination of siRNAs with seed sequences that are complementary to microRNA binding sites. Given that off-target effects via microRNA-like binding are the main source of RNAi screening phenotypes, avoiding native microRNA sites during siRNA design seems like a reasonable strategy. But does it make much difference in actual RNAi screens? Hasson et al. 2013 performed a mitophagy screen using the Silencer Select siRNA library. 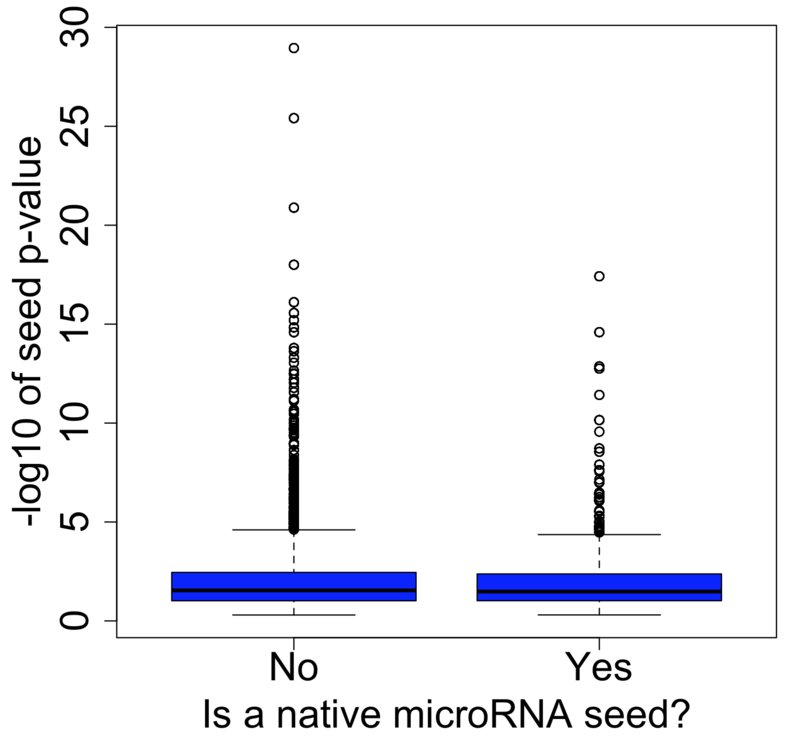 About 12% of the ~65,000 screened siRNAs have a 7-mer seed shared by a miRBase microRNA. We also examined a general phenotypic readout (cell viability) in a dozen large-scale RNAi screens. 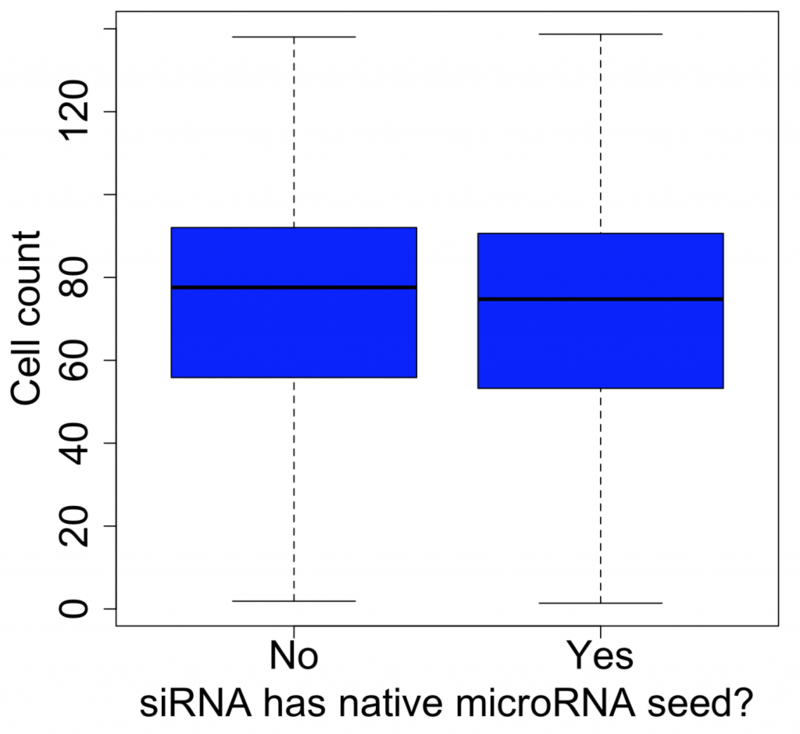 For some screens, we do see a slight shift in the values for siRNAs with or without native microRNA seeds. Removing those siRNAs does not change the dominance of seed-base off-targets. 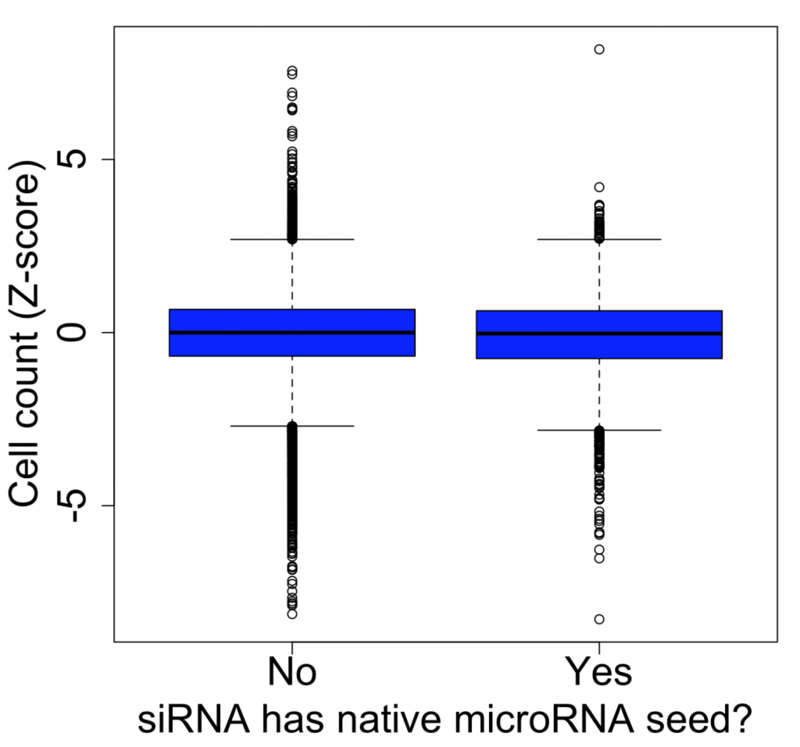 The intra-class correlation (ICC) for siRNAs with the same 7-mer seed is ~.53, with or without the inclusion of siRNAs with native microRNA seeds, while ICC for siRNAs with the same target gene is only ~.06. Coming back to the quote from the review article on genomic screening, next-gen RNAi library reagents that avoid native microRNA seeds are not expected to be much better than siRNAs that include them. Summary: Correcting for seed-based off-targets can improve the results from RNAi screening. However, the correlation between siRNAs for the same gene is still poor and the strongest screening hits remain difficult to interpret. Given that seed-based off-targets are the main cause of phenotypes in RNAi screening, trying to correct for those effects makes good sense. The dominance of seed-based off-targets means that independent siRNAs for the same gene usually show poor correlation. If one could correct for the seed effect, the correlation between siRNAs targeting the same gene may improve. This was the approach used by Grohar et al. in a recent genome-wide survey of EWS-FLI1 splicing (involved in Ewing sarcoma). They used the Silencer Select library, which has 3 siRNAs per target gene. 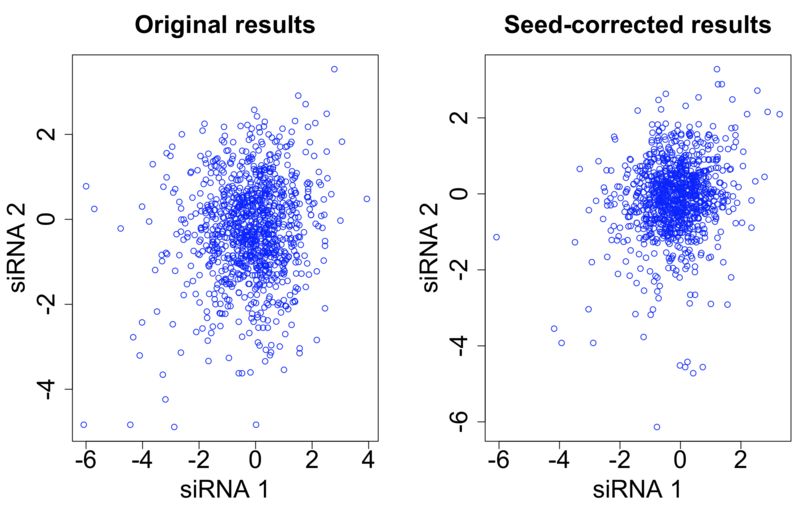 After seed correction, there is only minor improvement in the correlation between siRNAs targeting the same gene. The intra-class correlation (ICC) improves from 0.031 to 0.037. The ICC for siRNAs with the same 7-mer seed decreases from 0.576 to 0.261. Although we have reduced the seed-based signal, it has not resulted in a correspondingly large improvement in the gene-based signal. Grohar et al. used a simple seed-median subtraction method to correct their screening results. A more sophisticated method (scsR) was developed by Franceshini et al. for seed-based correction of screening data. It corrects using the mean value for siRNAs with the same seed, and weighs the correction using the standard deviation the values. 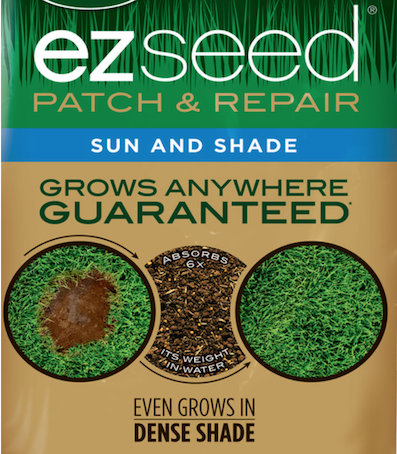 This allows seeds with a more consistent effect to contribute more to the data normalisation. The following plot shows the count for single-hit and double-hit genes as we go through the top 1000 siRNAs (of ~60K screened in total). 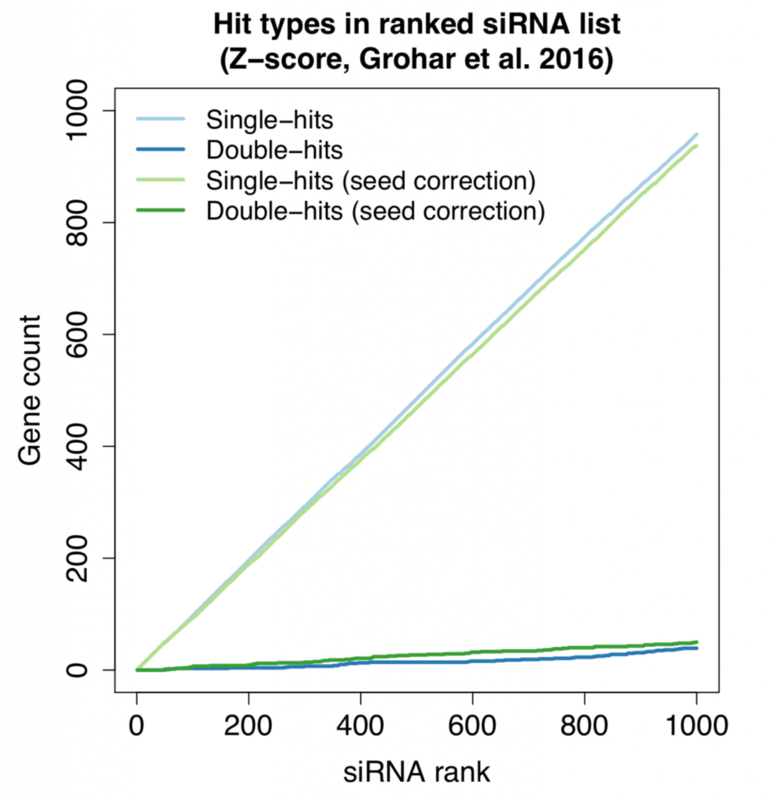 Double-hit means that the gene is covered by 2 (or more) hit siRNAs. Despite the small improvement in reagent correlation, the double-hit rate is essentially the same using simple seed-median subtraction or the more advanced scsR method. Furthermore, the number of double-hits is higher than what we’d expect by chance. This shows that, despite the noise from off-target effects, there is some on-target signal that can be detected. 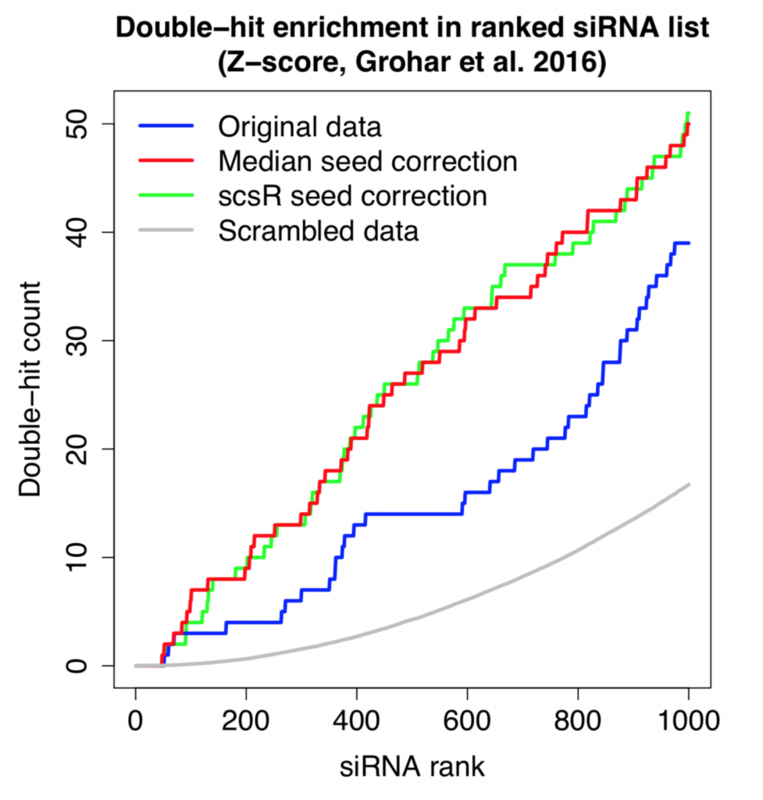 Despite the fact that the double-hit count is higher than expected by change, most of the genes targeted by the strongest siRNAs are single-hits. 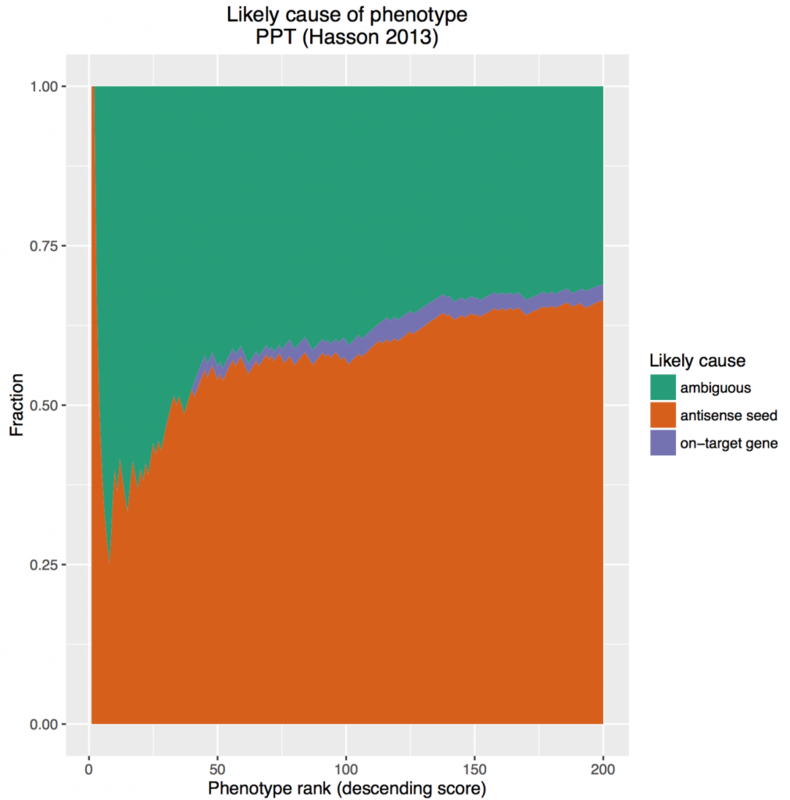 siRNAs with the strongest phenotypes remain difficult to interpret. Seed correction is best suited for single-siRNA libraries. Low-complexity pools, like siGENOME or ON-TARGETplus, are less amenable to effective seed correction since there are (usually) 4 different seeds per pool. This reduces the effectiveness of seed-based correction, even though seed-based off-target effects remain the primary determinant of observed phenotypes (as discussed here, here , and here). The best way to correct for seed-based off-targets is to avoid them in the first place. Using more specific reagents, like high-complexity siPOOLs, is the key to generating interpretable RNAi screening results. One way to compare the relative contribution of target gene and off-target effects is to calculate the correlation between reagents having the same target gene or the same seed sequence. One of the first things we do when analysing single siRNA screens is to calculate a robust form of the intraclass correlation (rICC, see discussion at bottom for more about this). Besides the order of magnitude difference between target gene and antisense seed correlation (which is commonly observed in RNAi screens), what stands out is the ~2-fold difference between the correlation by target gene and sense seed. Very little of the the sense strand should be loaded into RISC, if the siRNAs were designed with appropriate thermodynamic considerations (the 5′ antisense end should be less stable than the 5′ sense end, to ensure that the antisense strand is preferentially loaded into RISC). The above correlations suggest that some not insubstantial amount of sense strand is making it into the RISC complex. 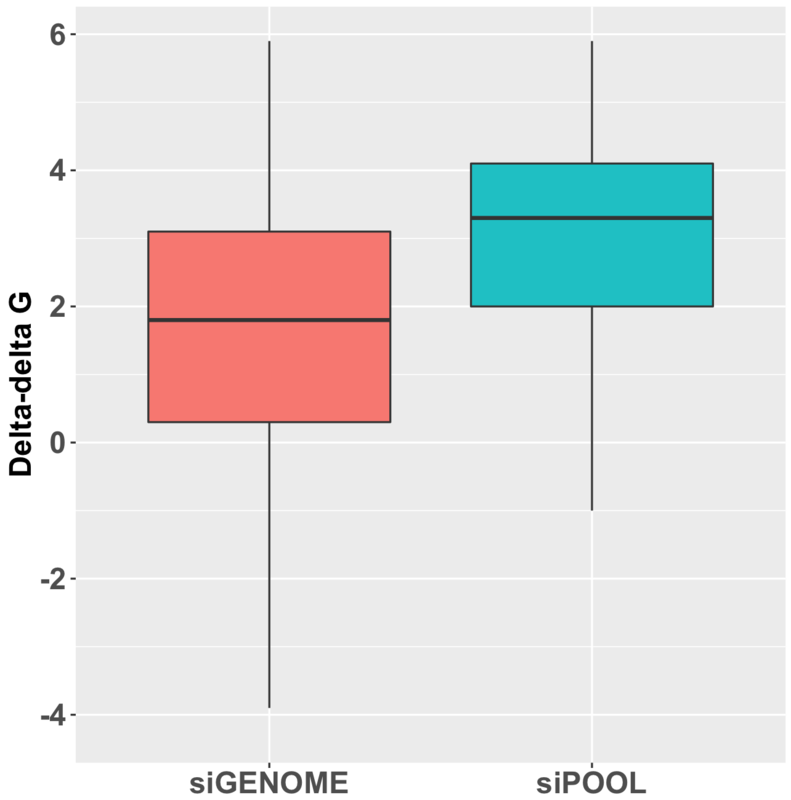 Here is the distribution of delta-delta-G for siPOOLs and siGENOME siRNAs targeting the same 500 human kinases (see bottom of post for discussion of calculation). A positive delta-delta G means that the sense end is more thermodynamically stable than the antisense end, favouring the loading of the antisense strand into RISC. The siGENOME knockdown data comes from 774 genes analysed by qPCR in Simpson et al. (2008). The siPOOL knockdown data is from 223 genes where we have done qPCR validation. Of note, the siGENOME pools were tested at 100 nM, whereas siPOOLs were tested at 1 nM. Intraclass correlation measures the agreement between multiple measurements (in this case, multiple siRNAs with the same target gene, or multiple siRNAs with the same seed sequence). One could also pair off all the repeated measures and calculate correlation using standard methods (parametrically using Pearson’s method, or non-parametrically using Spearman’s method). The main problem with such an approach is that there is no natural way to determine which measure goes in the x or y column. Correlations are normally between different variables (e.g. height and weight). 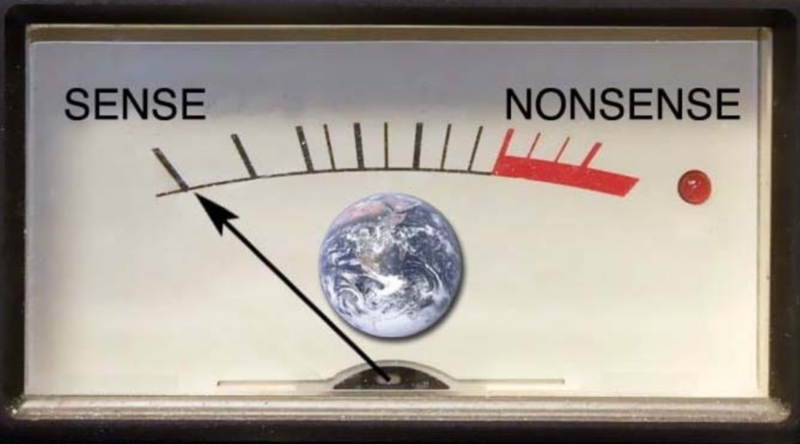 In a case of repeated measures, there is no natural order, so the intraclass correlation (ICC) is the more correct way to measure the similarity of within-group measurements. As ICC depends on a normal distribution, datasets must first be examined, and if necessary, transformed beforehand. Robust methods have the advantage of permitting the use of untransformed data, which is especially useful when running scripts across hundreds of screening dataset features. The algorithm we use calculates a robust approximation of the ICC by combining resampling and non-parametric correlation. Calculate mean of the rho values from 4. This is the robust approximation of the ICC (rICC). Values from 4 are also used to calculate confidence intervals. The program that calculates this is available upon request. Delta-delta G was calculated using the Vienna RNA package, as detailed here: https://www.biostars.org/p/58979/ (in answer by Brad Chapman). The delta-delta G was calculated using 3 terminal bps. We found that that ddG of the terminal 3 bps had the strongest correlation with observed knockdown. Others (e.g. Schwarz et al., 2003 and Khvorova et al., 2003) have also used the terminal 4 bps. 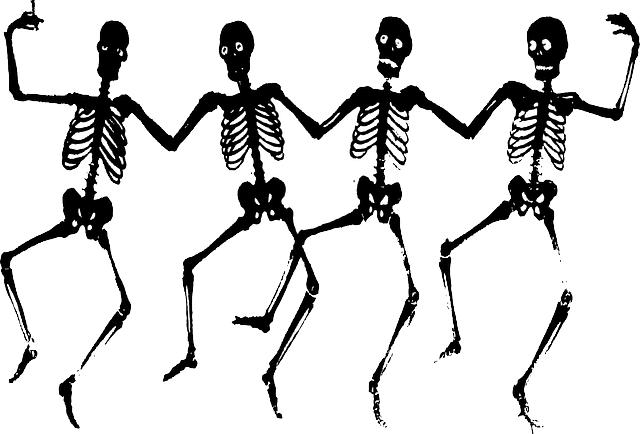 A recent article in The Scientist asks whether, in light of a paper by Lin et al. 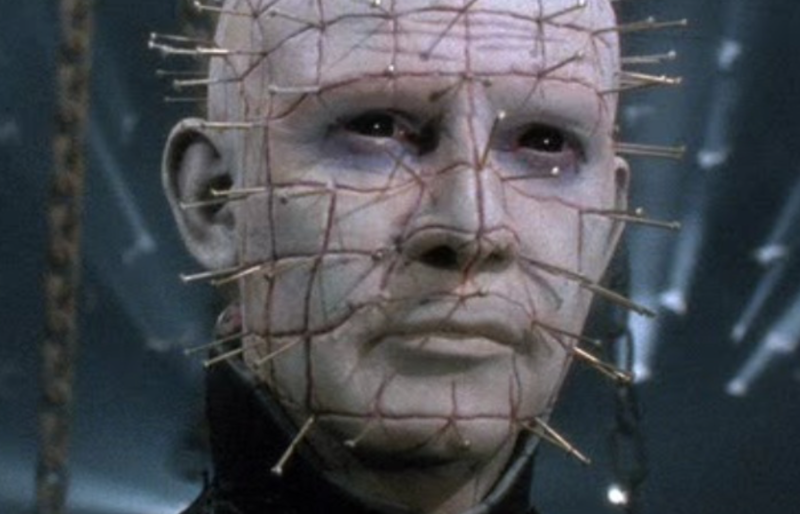 showing phenotypic discrepancies between RNAi and CRISPR, this is not ‘the last nail in the coffin for RNAi as a screening tool’? The paper in question found that a gene (MELK) that had been shown by many RNAi-based studies to be critical for several cancer types shows no effect when knocked out via CRISPR. They also report that in relevant published genome-wide screens, MELK was not at the top of the hit lists. Does this mean that the papers that used RNAi were unlucky and off-target effects were responsible for their observed phenotypes? Gray et al. identified MELK as a gene of interest based on microarray experiments. They then designed RNAi experiments to test its role in proliferation. Assuming that this study and the subsequent ones followed good RNAi experimental design (using reagents with varying seed sequences, testing the correlation between gene knockdown and phenotypic strength, etc. ), we can be fairly confident that MELK is involved in proliferation. It might not be the most essential player, which would explain why it is not at the top of screening hit lists. And screening lists have the draw-back of enriching for off-target hits. Another possibility is that Lin et al. have observed a known complicating feature of knock-out screens: genetic compensation. 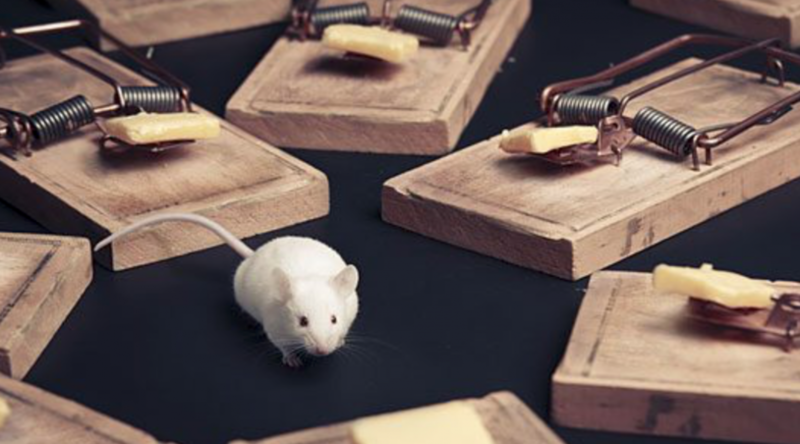 Although they undertake experiments to address this issue, it could be that compensation takes place too quickly for their experiments to rule it out. Furthermore, they could have addressed this issue by testing knock-down reagents themselves, and checking whether genes they hypothesise as responsible for the supposed off-target effect in the published RNAi work are in fact down-regulated. C911 reagents could also be used to test for off-target effects. This is extra work, but given that they are disputing the results in many published studies, this seems justified. Although we agree that validating CRISPR hits with RNAi reagents is important (especially if drugability is a concern), one has to be careful with RNAi reagents, like single siRNAs/shRNAs or low-complexity pools, that are susceptible to seed-based off-target effects. For validating CRISPR screening hits, siPOOLs provide the best protection against unwanted off-target effects, saving you time, money, and disappointment during the validation phase. In our last blog entry, we discussed a classic RNAi screening paper from 2005 that showed that the top 3 screening hits were were due to off-target effects. In this post, we analyse a more recent genome-wide RNAi screen by Hasson et al., looking in more detail at what proportion of top screening hits are due to on- vs. off-target effects. Hasson et al. used the Silencer Select library, a second-generation siRNA library designed to optimise on-target knock down, and chemically modified to reduce off-target effects. Each gene is covered by 3 different siRNAs. To begin the analysis, we ranked the screened siRNAs in descending order of % Parkin translocation, the study’s main readout. We then performed a hypergeometric test on all genes covered by the ranked siRNAs. For example, if gene A has three siRNAs that rank 30, 44, and 60, we calculate a p-value for the likelihood of having siRNAs that rank that highly (more details provided at bottom of this post). It’s the underlying principle of the RSA algorithm, widely used in RNAi screening hit selection. If the 3 siRNAs for gene B have a ranking of 25, 1000, and 1500, the p-value will be higher (worse) than for gene A. The same type of hypergeometric testing was done for the siRNA seeds in the ranked list. For example, if the seed ATCGAA was found in siRNAs having ranks of 11, 300, 4000, and 6000, we would calculate the p-value for those rankings. Seeds are over-represented in siRNAs at the top of the ranked list will have lower p-values. P-values were calculated using the cumulative hyper-geometric test (tests the probability of finding that many or more instances of members belonging to the particular group, in our case a particular gene or seed sequence). The p-value associated with a gene or seed is the best p-value for all the performed tests. For example, assume a gene had siRNAs with the following ranks: 5, 20, 1000. The first test calculates the p-value for finding 1 (of the 3) siRNAs when taking a sample of 5 siRNAs. The next test calculates the p-value for finding 2 (of 3) siRNAs when taking a sample of 20 siRNAs. And the last is the probability of getting 3 (of 3) siRNAs when taking a sample of 1000. If the best p-value came from the second test (2 of 3 siRNAs found in a sample size of 20), that is the p-value that the gene receives. This is also the approach used by the RSA (redundant siRNA activity) algorithm. One advantage of RSA is that it can compensate for variable knock down efficiency of the siRNAs covering a gene (e.g. if 1 of 3 gives little knockdown). Over the coming months, we will highlight a number of seminal papers in the RNAi field. The first such paper is from 2005 by Lin et al. 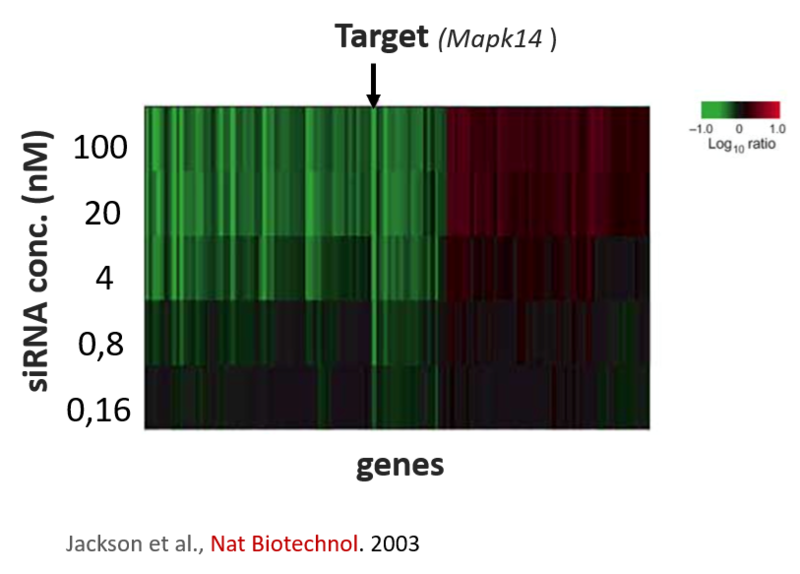 of Abbott Laboratories, who showed that the top hits from their RNAi screen were due to seed-based off-target effects, rather than the intended (and at that time, rather expected) on-target effect. The authors screened 507 human kinases with 1 siRNA per gene, using a HIF-1 reporter assay to identify genes regulating hypoxia-induced HIF-1 response. In the validation phase of their screen, they tested new siRNAs for hit genes, but found that they failed to reproduce the observed effect, even when using siRNAs that had a better on-target knock down than the pass 1 siRNAs. Figure 1A. Left panel shows on-target knock down of pass 1 siRNA for GRK4 (O) and the new design (N). Centre panel shows Western blot of protein levels Right panel shows HIF-1 reporter activity for positive control (HIF1A) and the original (O) and new (N) siRNAs. The on-target knock down is much-improved for the new design, yet its reporter activity is indistinguishable from negative control. Yet the pass 1 siRNA with poor knock down gives almost as strong a result as HIF1A (positive control). By qPCR, they then showed that GRK4(O) and another one of the top 3 siRNAs silence HIF1A (the positive control gene). Using a number of different target constructs they also nicely show that it was due to seed-based targeting in the 3′ UTR. Although the authors screened at a high initial concentration (100 nM), the observed off-targets persisted at 5 nM, suggesting that just screening at lower concentrations would not have improved their results. In addition, due to the large percentage of the off- target hits generated in the screening, using a redundant library without pooling in the primary screen could significantly reduce the efforts required to eliminate off-target false positives and therefore, will be a more efficient design than using a pooled library. This is true for low-complexity pools, but high-complexity pools can overcome this problem by providing a single reliable result for each screened gene. Once upon a time, it was imagined that siRNAs specifically knock down the intended target gene. Unfortunately, this turned out to be wrong. The disappointing results from siRNA screening following the initial high hopes brings to mind T.H. Huxley‘s famous quote about a beautiful theory being killed by an ugly, nasty little fact. As pointed out by S.J. Gould in Eight Little Pigs, the origin of the quote is given in the autobiography of Sir Francis Galton. 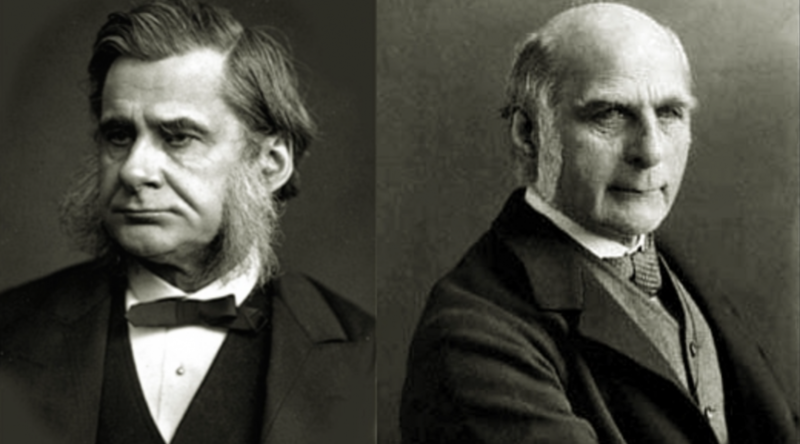 Galton’s autobiography is inspirational. As one reviewer put it, “there is a feeling of calmness and awe that comes from knowing that a person of his genius, wisdom and versatility actually existed.” He was 70, and had already made significant contributions to genetics, statistics, meteorology, and geography, when he published his first major work on fingerprints, which would become the basis for modern forensic fingerprint analysis. the ridges had to fulfil, and to work backwards. then. Huxley insisted. Spencer asked what it was.